Goa has received much well deserved criticism on account of the abounding garbage that spills over from every neighbourhood. There are remedies and schemes that have been thought out for the appropriate disposal of rubbish that comes under wet waste, that is biodegradable matter, and most dry waste that can be recycled or upcycled. There remains, however, the problem of waste that is delineated as toxic and detrimental to the environment. This includes biomedical waste and e-waste (electrical and electronic waste). In the case of e-waste, the Government of India has issued, through the Ministry of Environment, Forest and Climate Change Government of India, the E-waste Management Rules, 2016, which became effective from the 1st of October 2016. To understand the magnitude of the e-waste problem, we refer to the ASSOCHAM (Associated Chambers of Commerce and Industry of India)-Frost and Sullivan study (2016) that estimates that India’s e-waste production will be 30 lakh metric tonnes per year by 2018. E-waste is by far the fastest growing waste concern in terms of quantity in the world. ASSOCHAM also reports that merely 1.5 percent of e-waste is actually recycled in the formal sector. Therefore the urgency to control and reverse the damage already done grows by the minute. The cracks in the system, nonetheless, need to be repaired. Though legislations are in place, they are often not enforced effectively. Goa has just one company that deals with e-waste and that is Group Tenplus, which has partnered with Attero. Attero is a well-known company that boasts of being the only e-waste management company in India to be able to extract pure metals such as gold, silver, copper and other metals from e-waste. 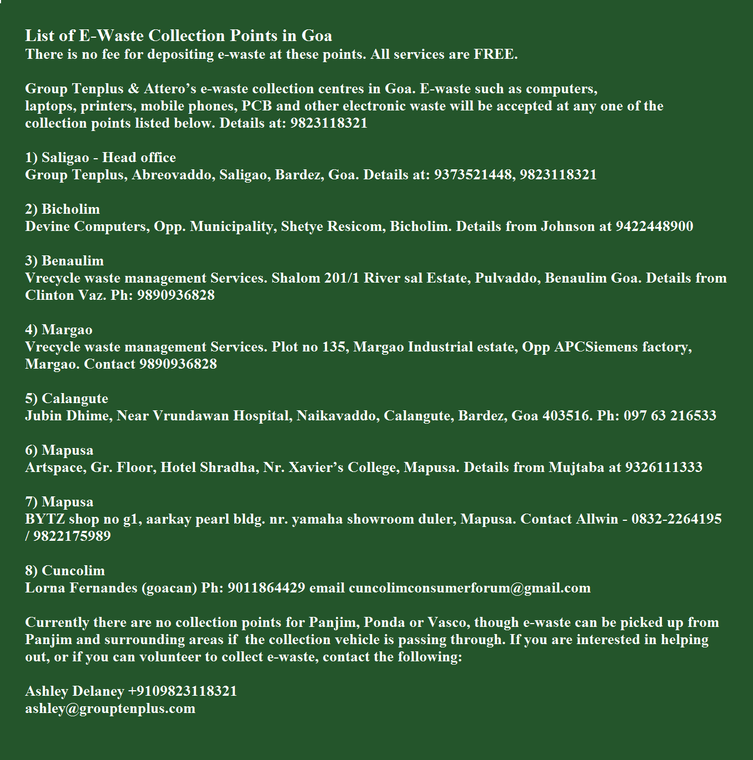 There are collection points for e-waste in various parts of Goa. Panjim, Vasco and Ponda do not yet have collection points but the company is willing to collect e-waste if passing through areas in and around Panjim. Clinton Vaz of vRecyle explains the myriad challenges of collecting e-waste successfully. For one, most people tend to opt for the open market or informal sector where they are offered a good price. The formal sector does not pay for the e-waste that is collected. For example, the old computer monitor can fetch Rs 650 and more. People need to be conscientious in the choices they make when disposing of their e-waste, since the informal sector does not dismantle e-waste in an environmentally friendly way. Besides the dismantlers are constantly exposed to toxic substances such as acids and gases when they handle the electronic waste without even a vestige of protection in the form of gloves or face masks. Workers in the informal sector suffer from respiratory ailments like asthma, bronchitis, breathing difficulties and other problems. They inadvertently succeed in polluting the environment too. By selling e-waste in the open market, one becomes responsible for the environmental impact as well as the health risk to the dismantlers. Once the e-waste does reach collection points like Clinton’s, he has to wait till he has accumulated at least 350 kg and more of the e-waste before he can pass it on to Group Tenplus and Attero. He has to make an inventory of the list of items received and their weight, and email the same to the collecting company. After the e-waste has been collected, vRecycle gives a receipt and receives a challan to authenticate the transfer of the waste. The e-waste travels to the central warehouse in Goa and from there to Mumbai and finally to Uttarakhand where the actual recycling takes place. A certificate of destruction is given to vRecycle once the e-waste is destroyed. ‘The paperwork itself takes at least half an hour. We used to not get any payment and it is actually more of a cost to us as recyclers. Only now we get Rs 15 per kilo, so we too can give something to those who bring us the waste now,’ says Clinton. As a responsible citizen, one should enquire if there is a ‘take back’ policy and whether there will be a refund. Many dealers have exchange offers but, once again, the likelihood of the e-waste finding its way to the informal sector is high. As consumers, we should be aware that the cost of disposing of electrical and electronic products that have served their purpose, being subjected to wear and tear, is already included in the price one pays for it. Some companies take back products but do not offer a refund, such as Titan watch batteries and HP ink cartridges. These companies need to be petitioned to have a refund scheme in place along with the take back policy. Other products come with specific instructions on how to send it back to the manufacturer when it is past its utility. HP, for example, collects the e-waste if one sends an email or makes a phone call to intimate the company. Clinton says, ‘Collect your e-waste and store it for as long as possible. Give it to collection points once or twice in a year,’ stressing the feasibility of doing so since individually we do not generate as much e-waste at a time, unlike larger institutions such as government departments, hospitals, corporate houses, etc. 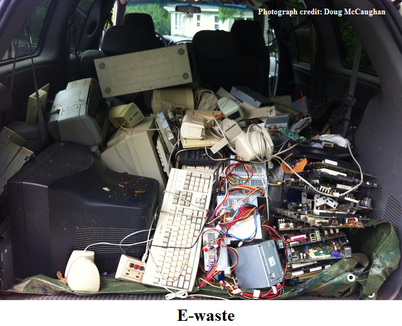 Clarity in understanding the difference between e-waste and plastic waste is essential. ‘If there is an electronic or electrical component, then it is e-waste,’ says Clinton. CDs do not make the list as e-waste as they have no electronic or electrical parts, yet vRecycle has to sort these out from the e-waste it receives. The simplification of the rules of e-waste management for the percolation of information, pressuring the government to take stringent action against those who intentionally do not keep the rules, and encouraging a conscience that supports the protection of our fragile environment, is vital for a better future on this planet we call home. *This article is based on a discussion held at the Friday Balcao, Mapusa.